What does it take to imagine that nonviolent approaches to conflict might be possible? 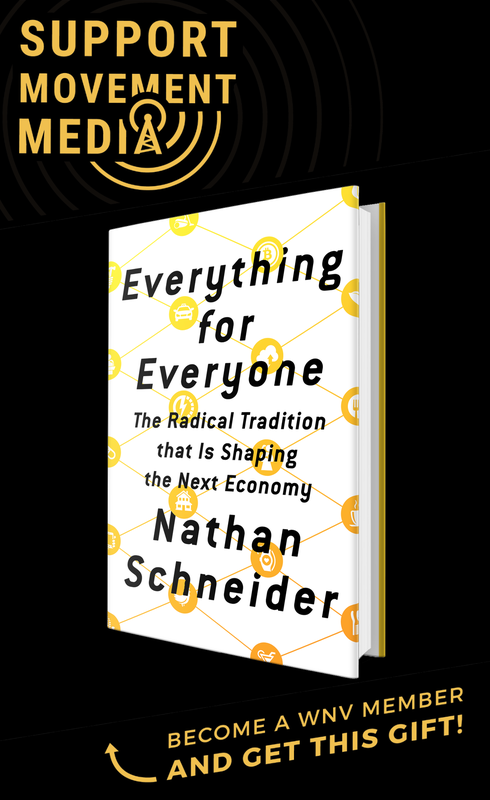 Millennia-old religious traditions? A prophet? Common sense? Certainly the last place one would expect to find it: a race of hardened warriors in a hardened land, where a gun is part of the common attire and tribal feuds last for generations. Yesterday evening, the Brooklyn Academy of Music screened T.C. McLuhan’s 2008 film—decades in the making—The Frontier Gandhi: Badshah Khan, a Torch for Peace. 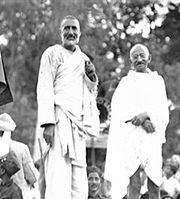 It tells a story desperately in need of being told: the life of Khan Abdul Ghaffar Khan, the towering Pashtun leader who worked with Mohandas Gandhi in the nonviolent struggle to rid colonial India of British rule. After that, he worked to dissolve the incendiary lines of cultural and religious identity that marked Pakistan from the beginning. In all, he spent a third of his 98-year life in prison. Those interviewed in the film refer again and again to a “miracle”: that Khan, a product of the chaotic tribal region in present Pakistan and Afghanistan, could have become a “Badshah”—an “emperor”—of peace. 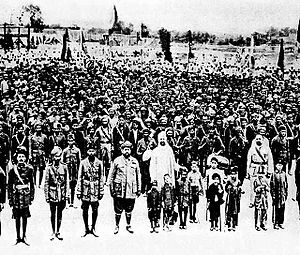 And that he mobilized a hundred-thousand-strong nonviolent army, the Khudai Khidmatgar, whose soldiers wore locally-spun red cloth, symbolizing their commitment to shed blood for the cause of peace and freedom. Amidst a supposed culture of killing, Khan came to realize that violence can only lead to defeat and the only victory worth having is a nonviolent one. At the time, many assumed that Khan learned his methods from Gandhi. Or perhaps through his British schoolteacher, Reverend Wigram. No, Khan insisted, he had come to them on his own, through his Muslim faith and through the traditions of his people. The most powerful parts of the film are those with the 82 Khudai Khidmatgar soldiers—5 of whom were women—that McLuhan managed to gather by traveling among remote villages of Pakistan and Afghanistan. All in their nineties at least, they spoke proudly of their service and of their devotion to the ideals that Khan taught. Khan was the son of a wealthy landowner, and he had a British education. But, by and large, not these men and women. Yet somehow, they fail to act out the barbarous stereotype that everyone—inside and out—seems to have about their society. Their witness reminds us, in fact, that traces of nonviolence are deeply ingrained in every human society, no matter how warlike. We forget this too easily when violence is all that titilates us enough to make headlines. The Frontier Gandhi could hardly be more timely, yet it also runs the risk of being lost in the same senseless politics that kept its subject so marginalized and persecuted throughout his life. India-Pakistan tensions were palpable in the voices of those in the present trying to claim or disown Khan. Pakistan has erased his memory from the schoolbooks, and former President Pervez Musharraf even appears in the film, calling the Badshah a detractor from the Pakistani cause. For Indians, however, he represents a vindication for the Gandhian legacy which they claim. During the incredibly violent period of partition between India and Pakistan, which Khan and Gandhi opposed, the Khudai Khidmatgar stood guard over Hindu homes and property in Pakistan to protect them from Muslim mobs. While the film shows people on Pakistani streets for whom Khan’s name doesn’t ring a bell, a gaggle of Indian schoolgirls gives a glowing account of his accomplishments. Worrying also is the appeal that this film might have for Western forces engaged in a war precisely where Khan lived and worked. Might promoting his story give rise to a more “passive” resistance? When Taliban fighters give up their guns to become meek peacemakers, one might imagine, it’ll be a whole lot easier to install a pro-Western nation state over the “lawless” tribal regions, ridding the universe of terrorism once and for all. Hamid Karzai, incidentally, praises Khan in the film. One can only hope that the convictions of Gandhi and Khan are true, that there is no weapon more powerful than nonviolent struggle, and that those who wield it, even against the American war machine, would truly and meaningfully win. At his death in 1988, Badshah Khan showed one last time his mastery as an artist of human spirit. Though he died in a hospital in Pakistan, he insisted on being buried in Jalalabad, Afghanistan, across the Khyber Pass. His family objected, but he insisted. And so it was. Thousands poured over the border, with no papers or passports. The Afghan civil war went on hold for a few days. Business as usual—warfare as usual—stopped for a while so that people could celebrate the vision of a great man. But there was a bomb. 15 people died, out of the hundreds of thousands who came in peace, in defiance of normalcy. There was a bomb, so the funeral was on the news.